Can Screaming Frog Check a Website/Web Page for Instances of Schema Mark-up? That was the question posed to me earlier this week. The short answer is yes, you can, and it’s actually extremely simple. 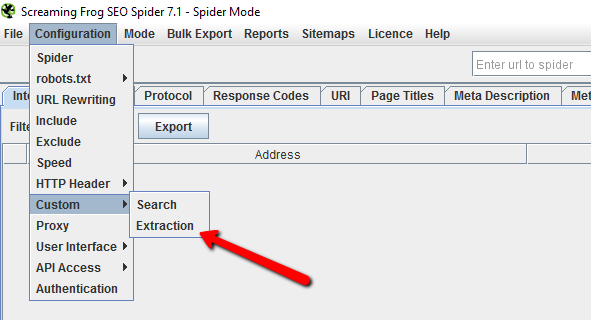 For those who may be unaware, in July 2015 Screaming Frog launched a new feature in version 4.0 called ‘Custom Extraction‘ allowing webmaster to extract custom HTML based on Regex, XPath or CSSPath rules. This feature has an endless amount of uses, from scraping content to identifying specific code declarations, such as checking the presence of a Google Analytics tracking ID on all pages of a site. Luckily, it can also be used to check a website for schema.org mark-up such as ‘LocalBusiness‘, ‘Product’, ‘Event’ and so forth. There could be a number of reasons why you would want to use Screaming Frog to extract schema mark-up. Alternatively, you may wish to use extraction to better understand the type of mark-up in operation (JSON-LD vs RDFa vs Microdata) or to identify particular schema properties which are perhaps unintentionally omitted from certain pages. There are endless reasons why you may want to do this. Most people will rely on the Search Console structured data report, but where’s the fun in that! The different types of mark-up utilise different syntax, therefore we’ll need a few extraction variations to ensure we can extract the correct type of mark-up. At this stage you may be aware of the type of schema mark-up in use on your/your clients website, or you may not; so with the following formulas you will be able to determine which type of schema mark-up is defined on a web page, the properties defined by that mark-up, and even the values contained. These are likely the most common uses of Screaming Frog for schema data extraction and will allow you to extract an array of data. The rules required and the configuration settings are as follows. The following rule will extract all schema data defined by the JSON-LD – so anything between the opening <script type=”application/ld+json”> tag and the closing </script> tag. Note: When exporting the data from Screaming Frog to Excel or CSV the line breaks will be lost. This rule will extract the name of any ‘itemtype’ defined via microdata on the given URL i.e. ‘LocalBusiness’, ‘PostalAddress’, ‘Product’ and so forth. This is great if you simply wish to determine which, if any, instances of microdata are in operation. Similar to the ‘itemtype’ rule, the ‘itemprop’ rule will extract the name of any properties defined by microdata on the given URL i.e. ‘Name’, ‘Image’, ‘Price’, ‘City’ etc. Please note that this will give you the name only; it will not provide the value defined (i.e. it will return the property ‘City’ not value ‘London’). This is a useful rule if you simply wish to determine which, if any, properties have been defined for each ItemType declaration. This regex formula will extract a single data item from a JSON-LD declaration. For example, if you know your schema mark-up is defined via JSON-LD and you know it uses the ‘ProductID’ property but you simply wish to know the value defined, you can use this rule to extract that data. Finally, you can utilise the following rule to extract ALL microdata from a given URL. This will extract the inner HTML of any ‘itemtype’ declarations essentially providing you with the HTML which carries the microdata. Note: The downside to this approach is that it may extract multiple instances of the same data. For example, if you had child ‘PostalAddress’ type nested beneath the parent ‘LocalBusiness’ type (which is pretty standard), the aforementioned formula will extract two sets of HTML, which will present some duplicate data; but you can slice and dice the XLSX or CSV data as you see fit. So there you have it! 5 relatively quick and simple extraction rules for Screaming Frog to obtain and better understand your schema mark-up! If anyone has any requests for data extraction, or if you have any alternative (or better!) ways to deploying the above extraction rules please let me know. This entry was posted in Crawling & Extraction, SEO. Bookmark the permalink. Screaming Frog sounds great. I’ve been seeing it in Youtube ads so many times too. I was wondering, do they have free trial for us to try out first? There is a free version but its functionality is limited. If you want a trail of the full version give Dan Sharp a shout on Twitter and I’m sure he’ll help you out. Great article Chris, thanks for sharing. I wanted to ask you, which of the several types (Microdata, RDFa, JSON-LD) of schema.org mark-up do you find working on the most? As it stands, all three approaches will work, but Google’s preference is JSON-LD; so if I had to pick one I’d definitely say try to use JSON-LD where possible. I’d recommend reading Google’s Introduction to Structured Data for more information on formats and placement. Thank you for the recommendation Chris! Great article. I tried to use JSON+LD, but google seems not indexed or just hasn’t put it on search result page. hi Chris thanks for sharing this I found it very useful, its surprising how many pages have the same code, I”ve been reading that schema and markup should be placed on a per page strategy not use the same markup across all pages what are your thoughts on this? Superb write up Chris – I had missed a couple of elements of this very robust process. Nice try but it’s ‘ not ” in the json ld extract…incase anyone is wondering why the one in this article doesn’t work. Which extract rule are you referring to? If it’s the “Extract All JSON-LD Data” one, then the use of ‘ or ” will depend on which you’ve used on your website – they can be used interchangeably. However, the general rule is to use quotes rather than apostrophes, so the rule is structured for the masses!